At this year's Rio Olympics, Katie Ledecky has become a household name for her five Olympic medals and three record-holding freestyle swims. Since then, more and more information about her star-studded past has made its way onto social media. 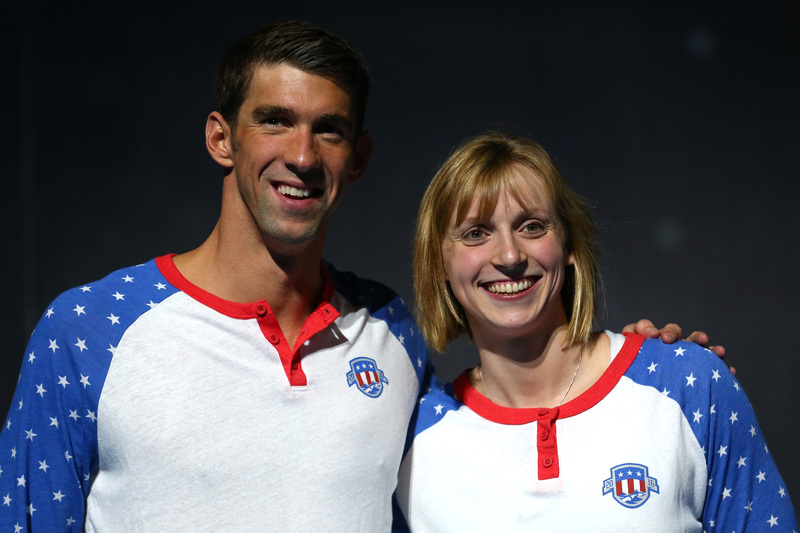 From the time she met Michael Jordan as a toddler to the time she met Michael Phelps as a burgeoning swimmer in 2006, Ledecky's brushes with fame seem to have predicated her own. Perhaps that's why Phelps and Ledecky posed for a remake of their iconic 2006 autograph photo, showing the world that, as far as they're concerned, Ledecky is about to be the world's biggest swimming star. The original photo was taken in 2006, and shows a young Ledecky standing while getting memorabilia signed by Phelps, who was fresh off his first big Olympic win at the 2004 Olympics in Athens. Ledecky looks excited in a nervous way while meeting the swimmer who was undoubtedly her idol. Now, however, she's embarking on her uniquely impressive journey, becoming an idol in her own right. In the recreated photo, the roles are reversed: Phelps is standing while Ledecky signs a poster, presumably for him. It's an adorable and telling tribute to their first meeting, and a symbolic passing of the torch to Ledecky as Phelps swam his last tournament, winning his twenty-third gold. The context surrounding the photo and its recreation is awe-inspiring. Considered one of the best performances in Olympic history, Ledecky's four-gold-medal winning streak is a testament not only to her incredible talent and sportsmanship, but to the increasing role of women in Olympic sports as well. Mic even poked fun at the sexist headlines calling Ledecky "the female Michael Phelps" by calling Phelps "the male Katie Ledecky," pointing out the continued trend of sexism in Olympics coverage. The meta photo-op itself came after a minor scandal less than a day prior, when a headline in a Texas paper went viral in which news of Phelps' silver win was placed above, and in larger font than, news of Ledecky's gold. Whether the photo was taken and published as a counter to the implied competition between Phelps and Ledecky or, more likely, was taken earlier and posted coincidentally following the sexist headline scandal, a photo showing the world's current best swimmer on the brink of retirement getting an autograph from a young woman at the start of a career that will likely propel her into the "world's greatest" category speaks volumes.